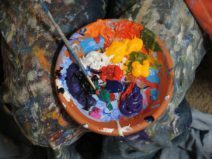 Selling art can be tricky, but there’s a whole other element involved when entering into business negotiations with artwork that has sentimental value. When Marina Picasso was a child, her grandfather, the renowned artist Pablo Picasso, used to make flowers out of paper for her, she told Doreen Carvajal of the New York Times. But the little works of art were taken away from her. The memory is symbolic of Marina Picasso’s relationship with her grandfather. She says that her mother scrounged for meager handouts from the Picasso family to support her children after her brief marriage to the artist’s son. Marina, her brother, and both her parents were repeatedly shunned and mistreated by the great artist and his family throughout her life, she says. Marina’s brother, Pablito, killed himself a few days after being barred from their grandfather’s 1973 funeral by the artist’s second wife. Decades later, Marina Picasso, now 64, owns about 10,000 original pieces of Picasso art—including an estimated 300 paintings—having inherited about a fifth of her grandfather’s estate, including his French villa. And the decisions she is making about that art is raising both concern and excitement in different quarters of the art world. For years, Marina Picasso relied on a trusted art dealer to help her sell her grandfather’s artwork to support herself and various charities write Carvajal. After the dealer’s death in 2008, Picasso sold several works of art through various auction houses. Now Picasso says she intends to sell many of the artworks she owns privately in order to fund her philanthropic efforts. The revelation is sparking alarm among many that she will “flood the market and depress prices” for Picasso’s artwork, according to the Times. Choosing to negotiate or auction the sale of valuable art on one’s own is a risky decision. On the one hand, Picasso likely is motivated to avoid paying high fees to a dealer or auction house. Yet her decision to sell pieces “one by one, based on need” could be a haphazard approach that fails to attract the most interested buyers or secure her the highest prices possible. A lack of expertise in the world of art negotiations and auctions could also work against her. Picasso had told Carvajal that she had a disappointing experience working through the legendary Sotheby’s auction house to sell two major Picasso paintings. Sotheby’s secured $8.6 million for the Picasso paintings. Marina Picasso said she had expected buyers to offer more because they knew that the money would support her charities. The statement suggests she may have unrealistic expectations of both the art’s value and of buyers’ actual motives. Mariana Picasso, who published a damning memoir about her grandfather and his family, openly admits that her decision to sell the art has a strong emotional undercurrent. For her first solo sale, she says she intends to rid herself of a 1935 portrait of a family standing in an arid landscape, which symbolizes the lack of love she felt from the Picasso clan. For those looking advice for their own business negotiations, the story has several interesting elements. First and foremost, it points to the inherent danger of approaching business negotiations with strong negative emotions. Abundant research has shown that strong emotions, such as anger, lead to impulsive and irrational decision making at the bargaining table. Compared to being in a neutral mood, for example, being in an angry mood leads us to make more simplistic, irrational decisions, to blame others when things go wrong, and to make overly optimistic risk estimates, according to Harvard Kennedy School of Government professor Jennifer S. Lerner. Another common negative emotion, sadness, can have a similarly destructive influence on our business negotiations. When we’re in a sad mood, as compared to being in a neutral mood, we are more likely to sell possessions for much lower prices, purchase new possessions for much higher prices, and become fixated on initial offers, Jennifer S. Lerner has found in her research. Unfortunately, we are often unaware that our emotions can have such a significant impact on our judgments and decisions in price negotiation and other forms of negotiation. That’s why Lerner advises negotiators to wait until strong feelings have waned before making an important decision in a business negotiation. What if, like Marina Picasso, the strong emotions are deep-seated and unlikely to ever pass? In such cases, you would be wise to seek the help of neutral advisers, such as a trusted friend or an agent. An outsider to whatever conflict you are embroiled in—whether internal or external—should be able to test the rationality of your business decisions and help you to improve your negotiation skills. What are your thoughts on the art of business negotiations and emotions? Leave us a comment. Related Negotiation Skills Article: Will Your Negotiation Get Sidetracked? Are not you prejudging the owner’s intentions here? I believe you are presuming that maximizing monetary value and preserving market value of the Picasso assets should be the owner’s goals here. I’d suggest from what I’ve read, those are not the owner’s goals. So you want to impose upon the owner goals that are yours (and others who hold Picassos), and not hers. Are you suggesting a social duty that the owner uphold the market price of Picassos? If so, on what grounds? I hope my comment does not sound overly critical. I agree with the general premise that emotion can get in the way of sound financial negotiation and issue resolution. I’ve seen it firsthand in a palimony case where the wealthy partner would have saved a bundle had h/she settled up front with a reasonable monetary request by the other partner. The main thrust of the article is not to criticise Marina Picasso or to make suggestions to her. Katie Shonk is making a valid point about emotions (regardless of whether we consider them positive or negative) interfering with business decisions. Maybe Ms Picasso’s motives were not business-like, but that’s beside the point.